These jam filled cookies will go down a treat with kids and grown ups alike! Preheat the oven to 180°C/ 350°F/ Gas Mark 4. Cream together the butter and sugar until light and creamy. Add the beaten egg yolks and vanilla and mix well. Gradually add the flour and mix until the mixture forms a firm dough. Wrap with cling film and chill for 1 hour. Roll the dough to 3mm thickness on a lightly dusted surface. Divide the dough in half and cut out an equal amount of smiley faces and solid hearts. Divide the dough in half and cut out an equal amount of smiley faces and solid hearts. Bake the cookies for approximately 8 minutes or until lightly browned. Transfer the biscuits onto a cooling rack to cool. 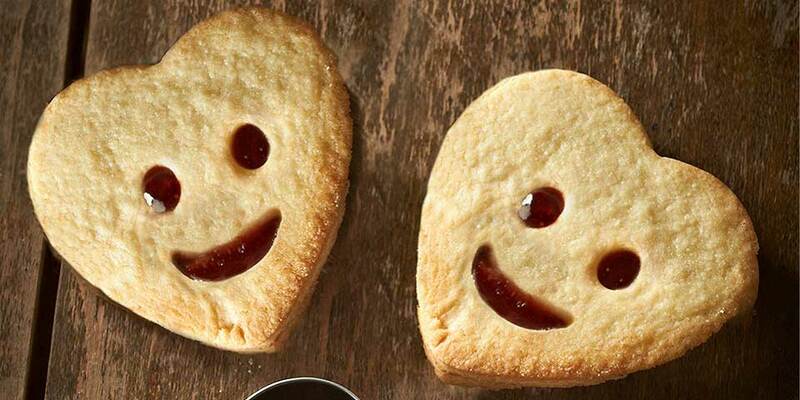 Once cooled, place a teaspoon of your chosen filling (we have used strawberry jam) onto the solid heart and place the smiley face cookie on top.